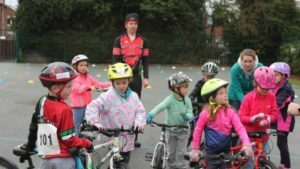 This had great attendance all year last year, so get involved this year and keep it going, the kids have all learned some fantastic skills and it will help keep them safe when they venture out onto the road. Big thanks to Mark, Haydn, Cheri & Lucy for their time and effort. The comp days will have a competitive race at the end of the session, testing the skills learnt in the recent sessions. We will run a league through the year with results counting from the comp days. The Event days will be longer events have multiple competitive races, with awards for winners on the day. Primarily these sessions will be held at St Peter’s School Rossett, but we will be looking to hold some sessions at other locations, to offer a chance to develop skills on different terrains (more details will follow when confirmed). Each session will be £2.50 for members and £4 for non-members. Alternatively, we are offering a season ticket, which covers membership and all 2018 events at a cost of £25 per child (or £22 if you have already joined via BC). We are offering 25 season tickets, so please confirm ASAP if you wish to purchase a season ticket by mailing goride@wrexhamcyclingclub.co.uk and we will send you the payment details. Please also let us know if you have joined online via the British Cycling website. In addition, all parents/guardians/carers will need to complete a new rider info/consent form before their first session.